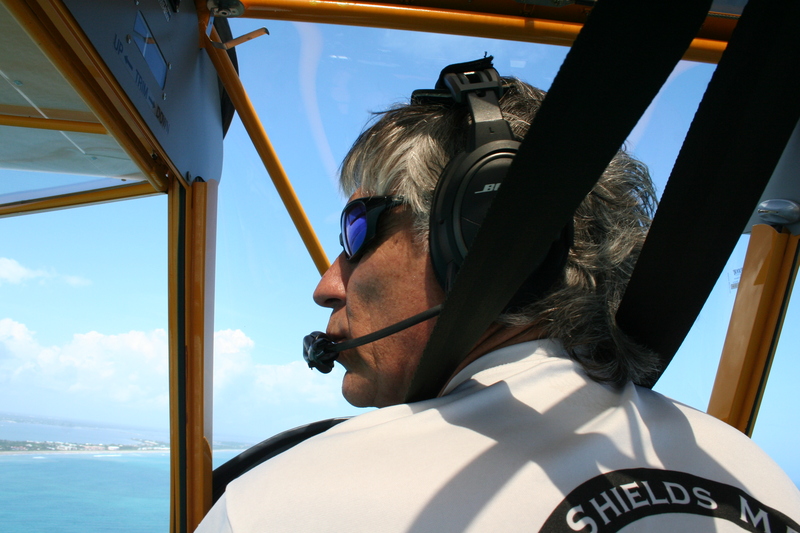 My “Road Trip to the Glades” series is meant to be an experience of exploration. Exploration into a world many of us from the Coast have not seen. It is my hope that through learning about the Glades communities we can forge insights and hopefully friendships that assist us in our journey for a solution to Lake O’s discharges, Senate President Elect Joe Negron’s land purchase proposal for 2017, and a restored Everglades including a healthy St Lucie River/Indian River Lagoon. 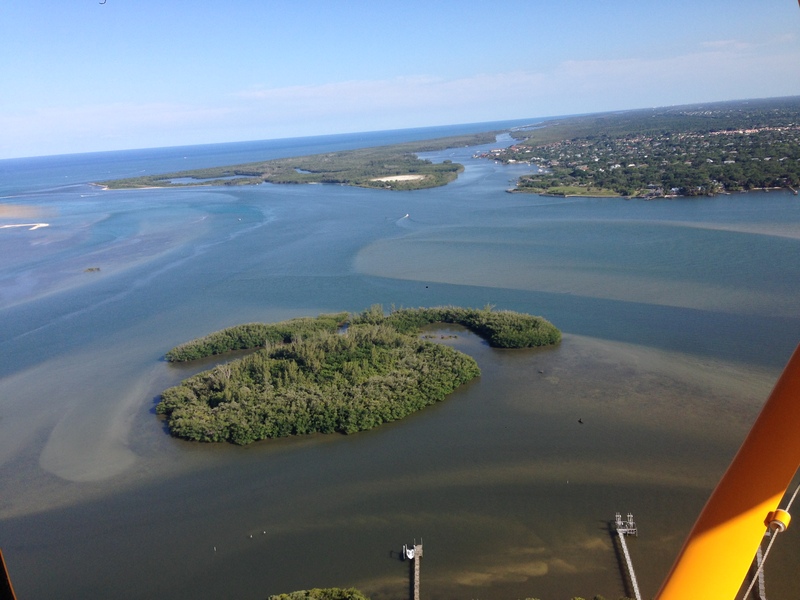 At this point, as river advocates, we must make clear that we wish to attain these things, not at the expense of the communities of Lake Okeechobee. The best way to begin this conversation is to educate and visit there ourselves, because yes, #GladesLivesMatter. We begin first our journey driving west from Stuart on Kanner Highway, named for Judge A.O. Kanner. “A.O.” had an accomplished legal and legislative career, and in 1925 was chosen to move to Martin County by longtime friend and colleague, Governor Martin, to get newly founded Martin County “off to a good start.” A note of interest is that “Abram” and his wife Mary were one of Martin County’s few Jewish families. At the time, Jews were not allowed to buy in certain subdivisions. 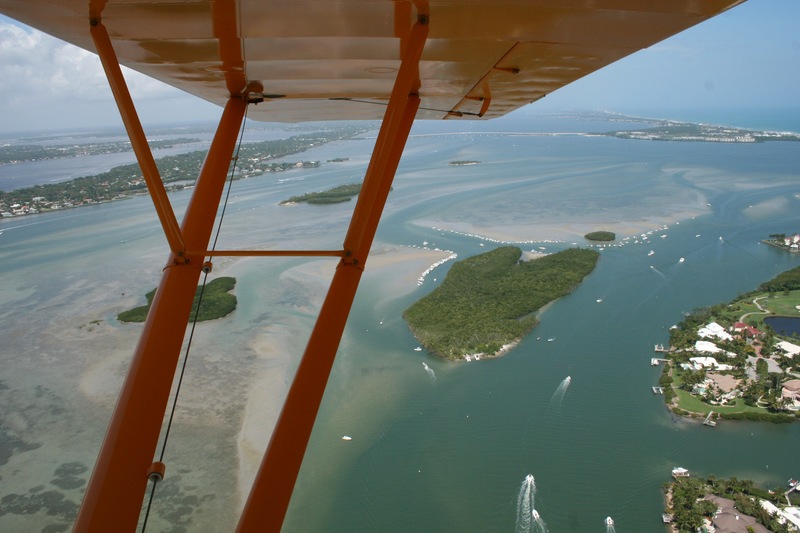 But thankfully Kanner was embraced by the Martin County community, and became one of its most respected citizens. He lived in Stuart until his death in 1967. As a legislator, Kanner fought for roads. State Road 76, was the result of his effort to get good roads to the Glades. It is on his legacy that we will drive forward. 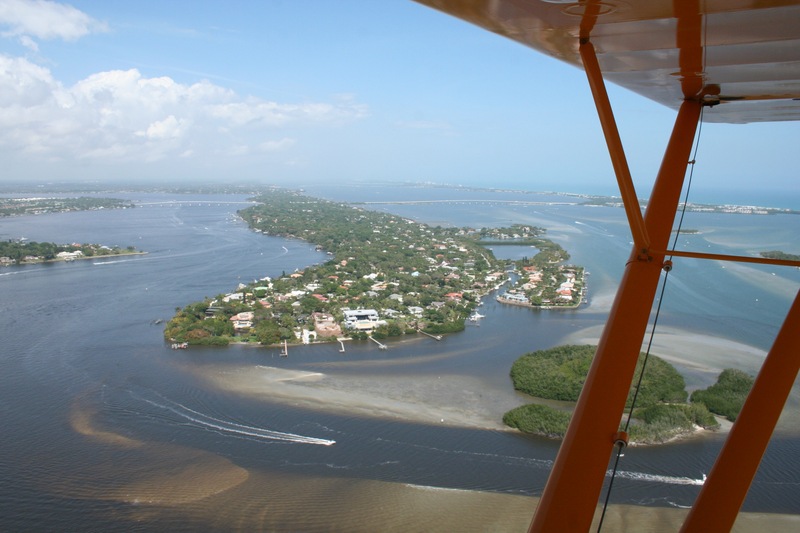 Driving west about twenty miles outside of Stuart, we pass Indiantown. We see train tracks, agricultural fields, and wonderful open natural lands such as DuPuis Wildlife Area. All the while the C-44 canal is to our right. An eagle flies overhead. The blue and white clouded sky seems bigger here. Just a few miles before reaching the Lake we see the looming Port Mayaca Cemetery. In this cemetery are buried in a mass grave 1600 of the 3000 dead from the horrific 1928 Hurricane. A stark reminder of the past, the power of Mother Nature, and how we live dangerously so in a drained swamp. There are graves of others not associated with the hurricane too. Old families. 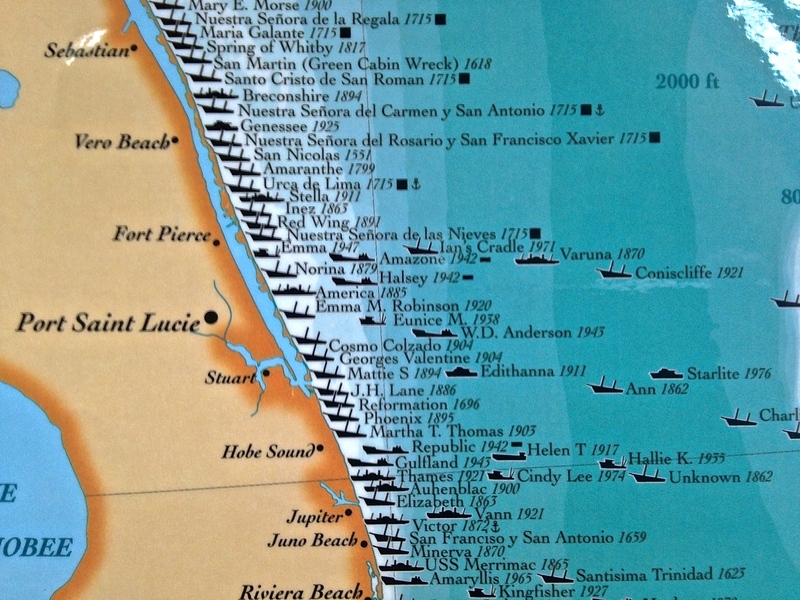 People whose blood and sweat laid the ground for South Florida’s development. Many of the family plots go back to the 1800s. Getting back into the car and back on Kanner Highway, we drive past sod farms and sugarcane fields. King Ranch has a sign with their brand atop. 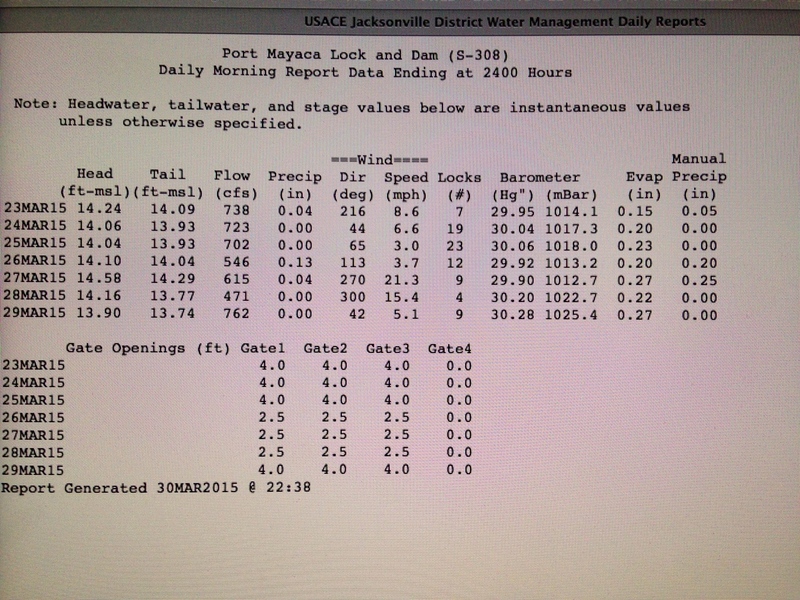 After about 10 minutes, slowly and with caution we approach Port Mayaca. 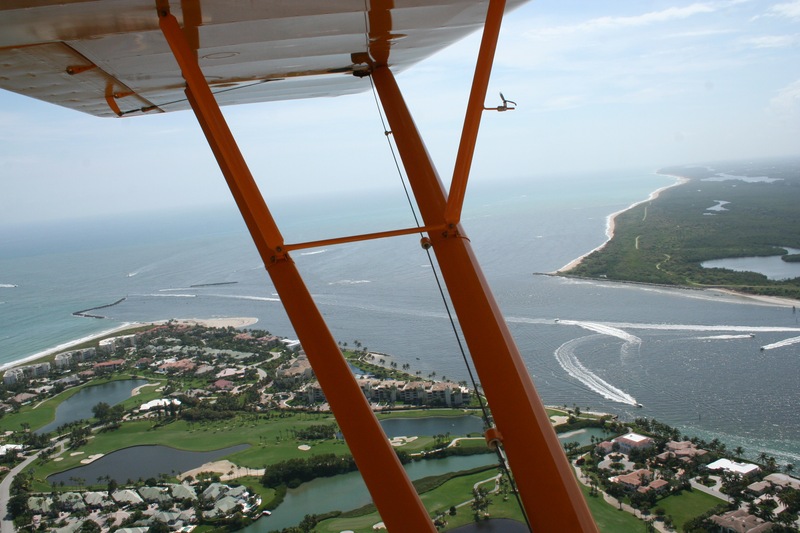 It is impossible to see Lake Okeechobee herself as a gigantic berm and structure surround her. 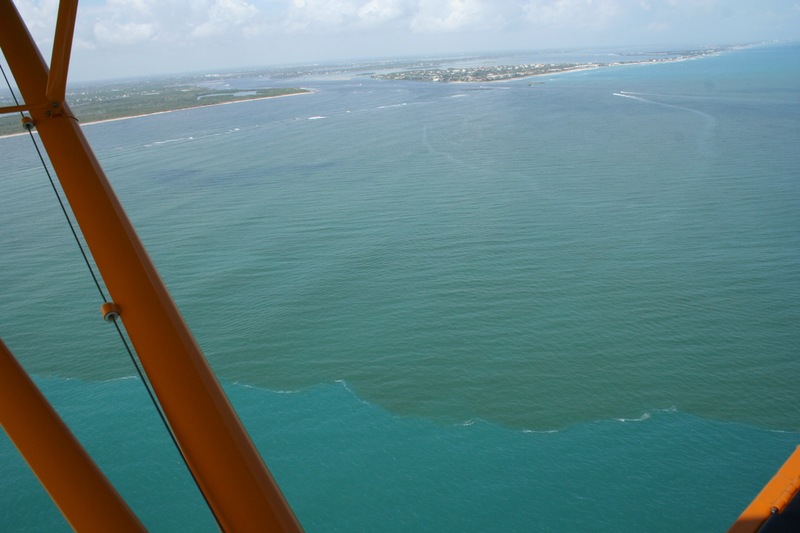 We do see the ACOE’s S-308, the structure that allows water to enter the C-44 from Lake Okeechobee that eventually flows and destroys the St Lucie River. 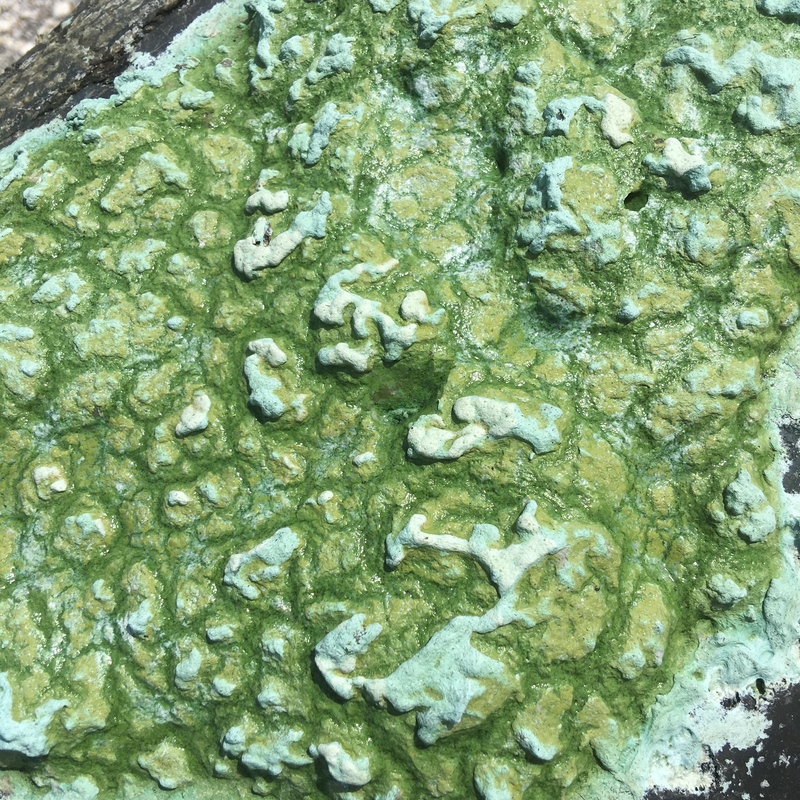 Strangely, we notice an “advisory” blue-green algae sign prominently displayed while at least four people are fishing in the canal. Pulling onto the once famous toll road of Connors Highway and going south, we see the berm of Lake Okeechobee. 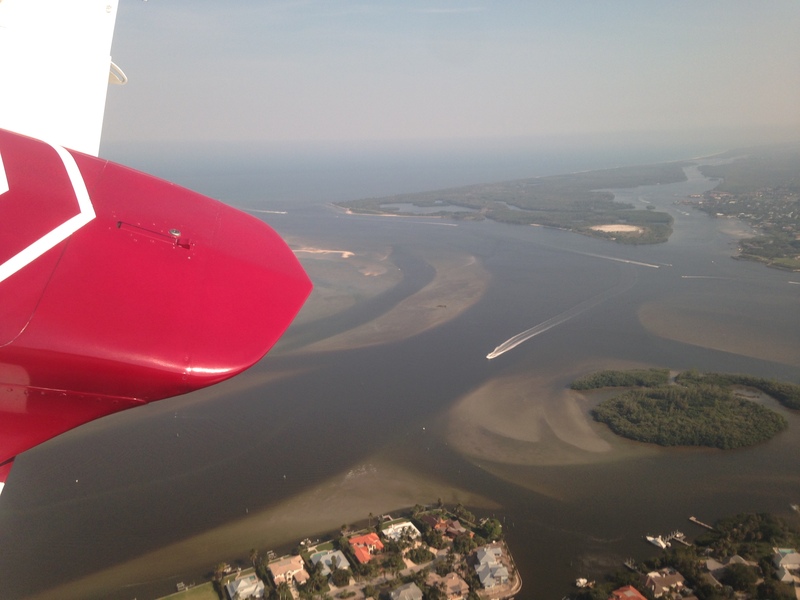 We leave Martin and enter Palm Beach County. Large trucks fill the road. It is nerve-wracking but exciting. Some beautiful old homes stand amoungst thickets of royal palms and tropical vegetation. Roses and honey are for sale if one has the nerve to pull over. After about twelve miles we reach Canal Point. 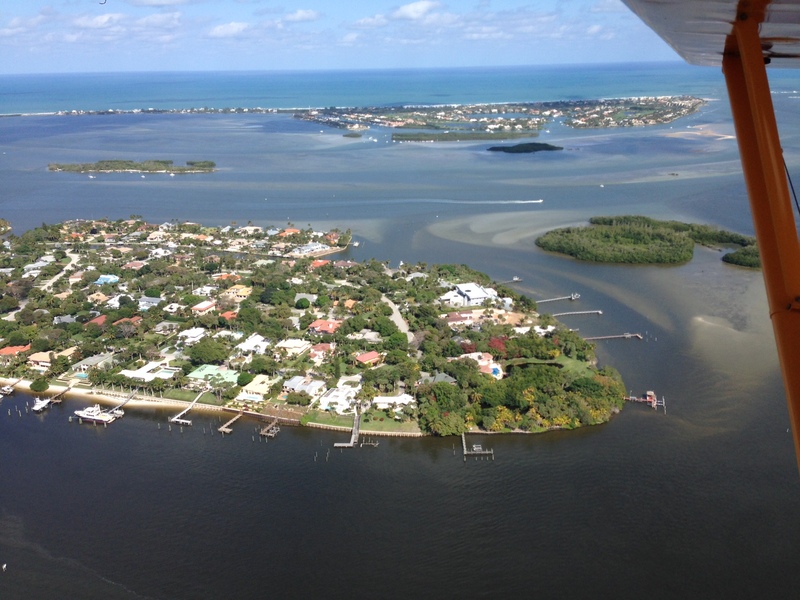 Canal Point is not incorporated, but part of Palm Beach County. 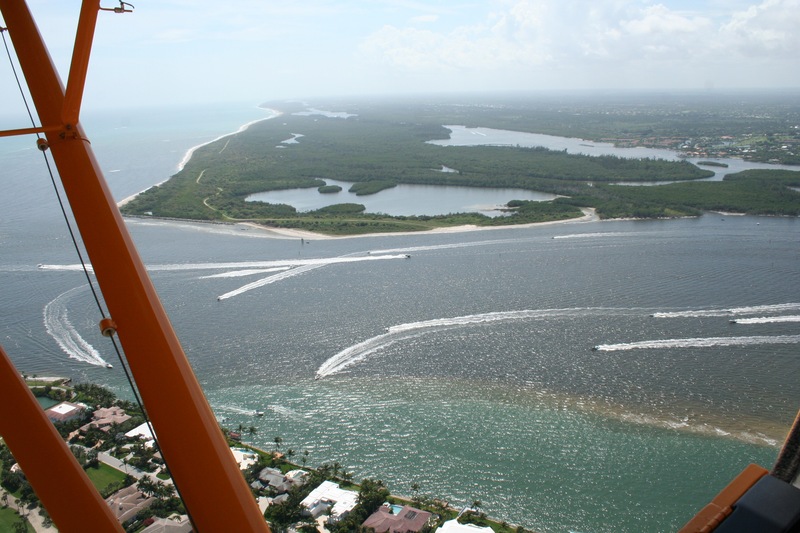 At this location is S-352 built in 1917, today’s SFWMD’s structure allowing water into the West Palm Beach Canal, Water Conservation Area 1, as well as being used for irrigation. We take a sharp turn into the Canal Point Recreation Area praying not to get rear ended. 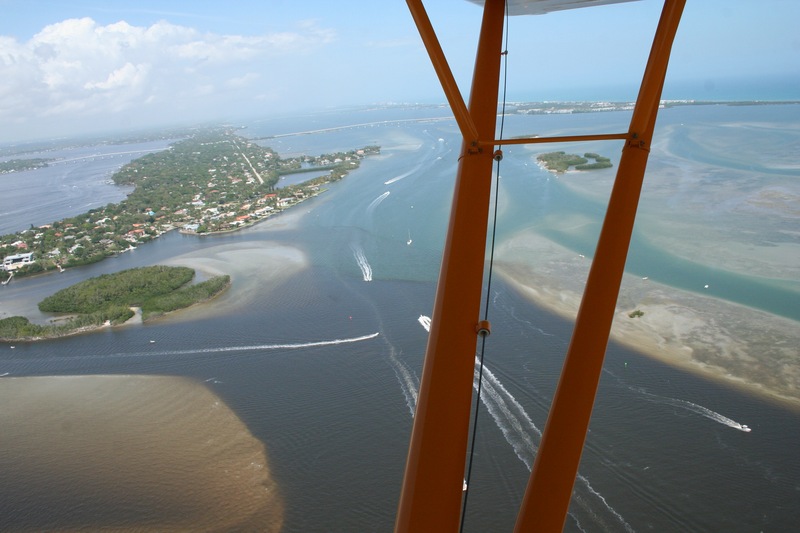 Here we can drive on top of the dike and take a look at Lake Okeechobee and across the street. Fishermen fish near the structure. An alligator waits nearby. It’s nice to see some wildlife. A beautiful Baptist church stands among tidy homes. A U.S.Department of Agriculture Research Service Sugarcane Station also sits along the Connor Highway that hugs the lake not too far from S-352. 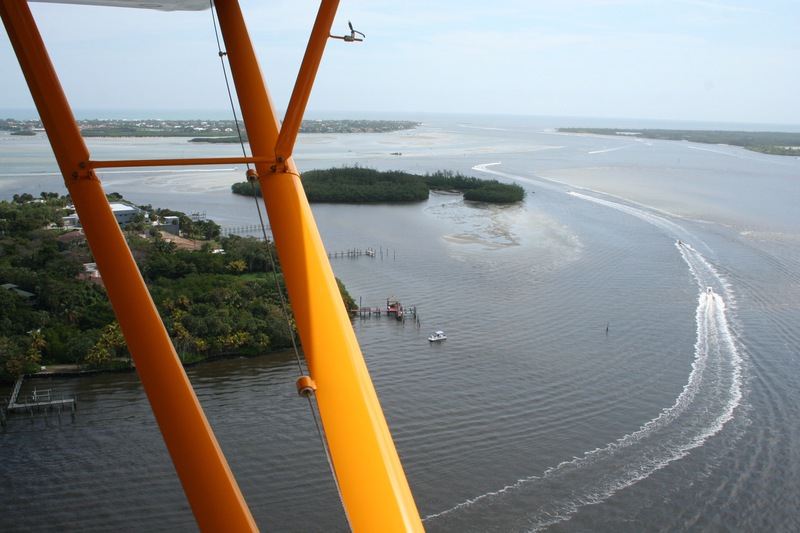 Canal Point has about 525 people and the town is very small located between Lake Okeechobee and sugarcane fields. From what we can see there is also a post office, one elementary school, and a store. 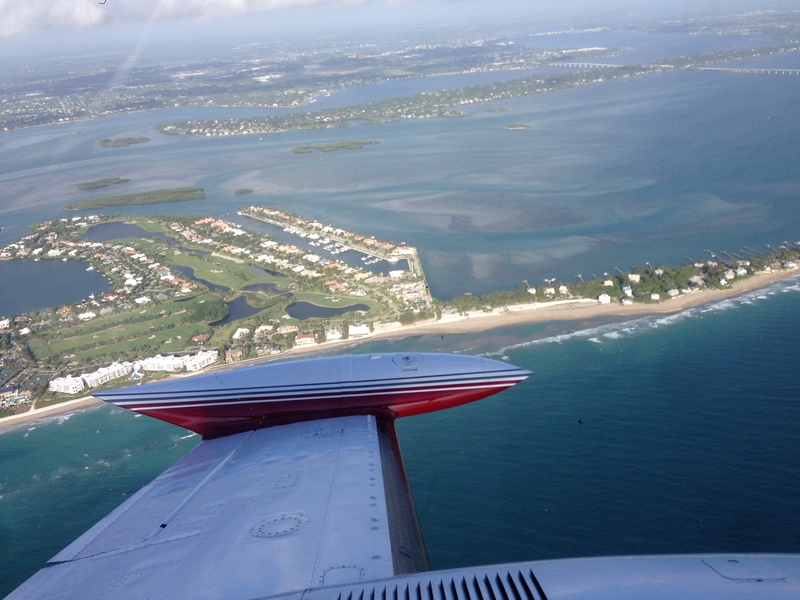 Larger, Pahokee is just a few miles away. This little town has a rich and important history. 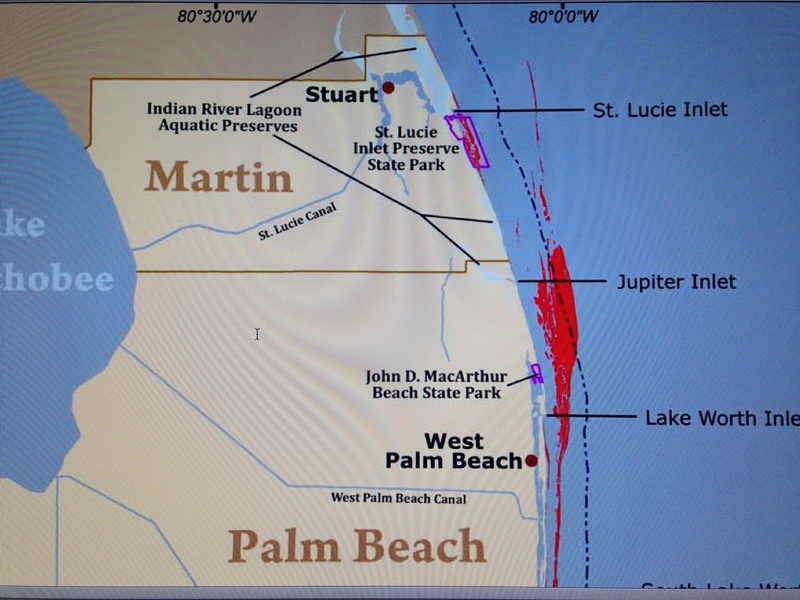 In the coming days we will learn about Canal Point’s mark on the Northern Everglades of which we are part. 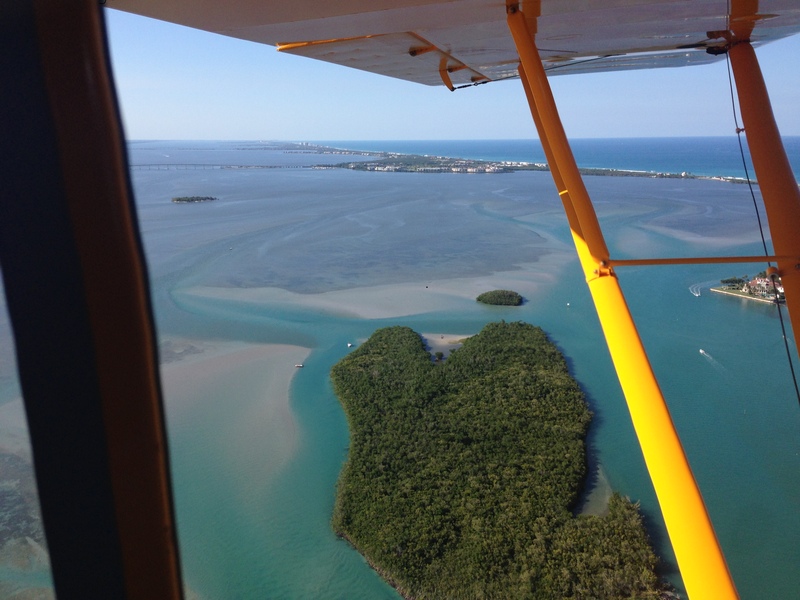 4-13-15 Sailfish flats, all photos in this post by Ed Lippisch. This post is a follow-up to the ACOE periodic scientist call on 4-14-15. Photos are from 4/11/15 and 4/13/15. 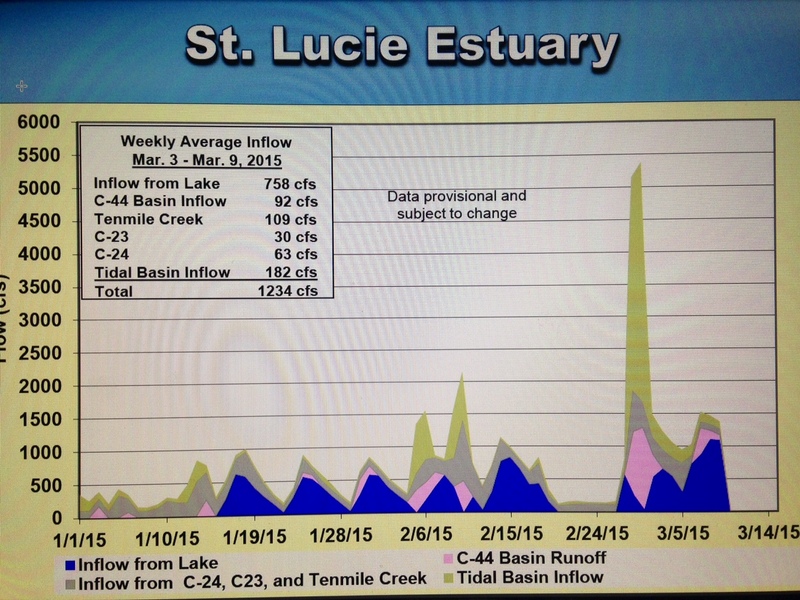 To summarize for the public, basically on 4-3-15, the ACOE’s pulse release schedule from Lake Okeechobee, that was up to 500 cfs (cubic feet per second) the previous week, had stopped and gone to 0 in order to facilitate bacteria testing by Martin County in St Lucie River waters. 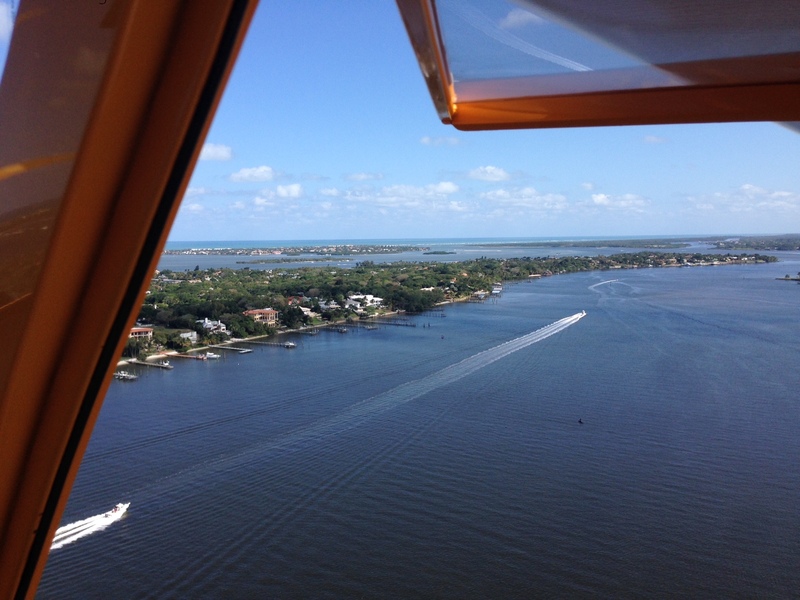 4-11-15 Plume exiting St Lucie Inlet. 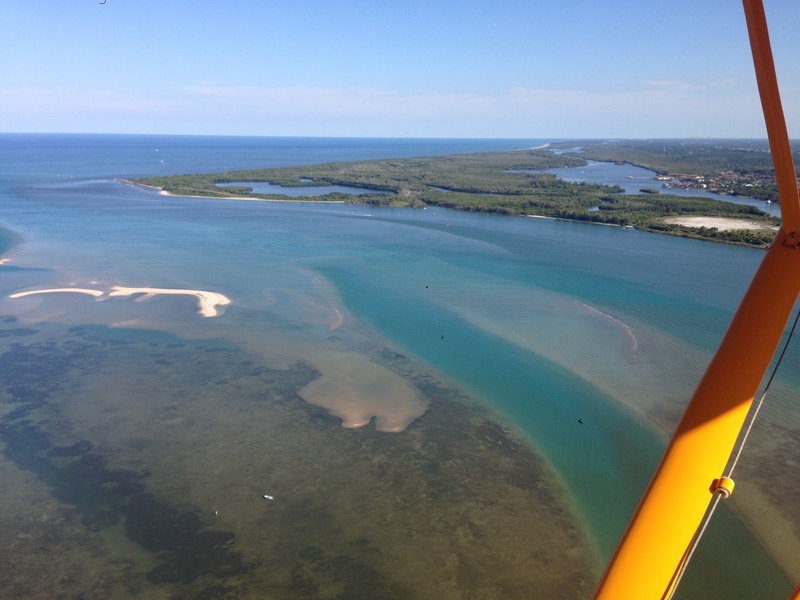 4-11-15, along Jupiter Island’s near shore reefs to Peck’s Lake. 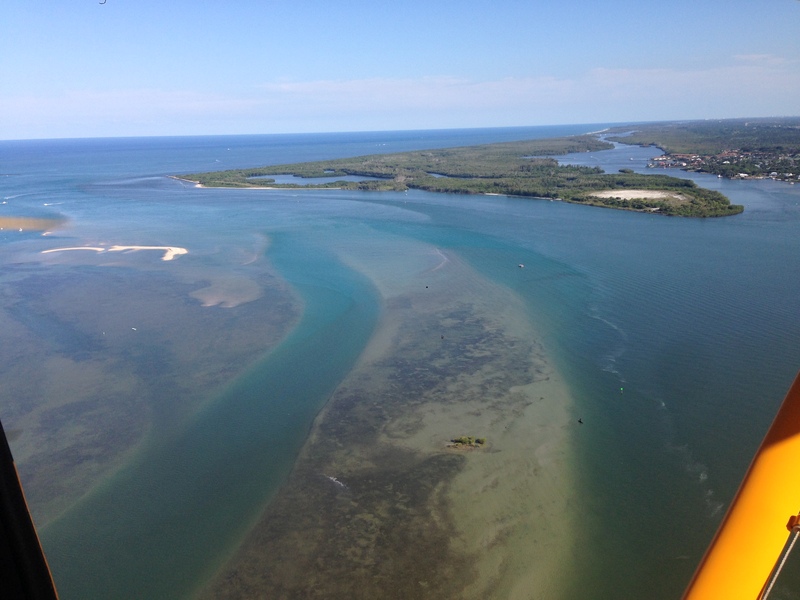 4-13-15 Sailfish flats and seagrass beds area between Sewall’s Point and Sailfish Point. 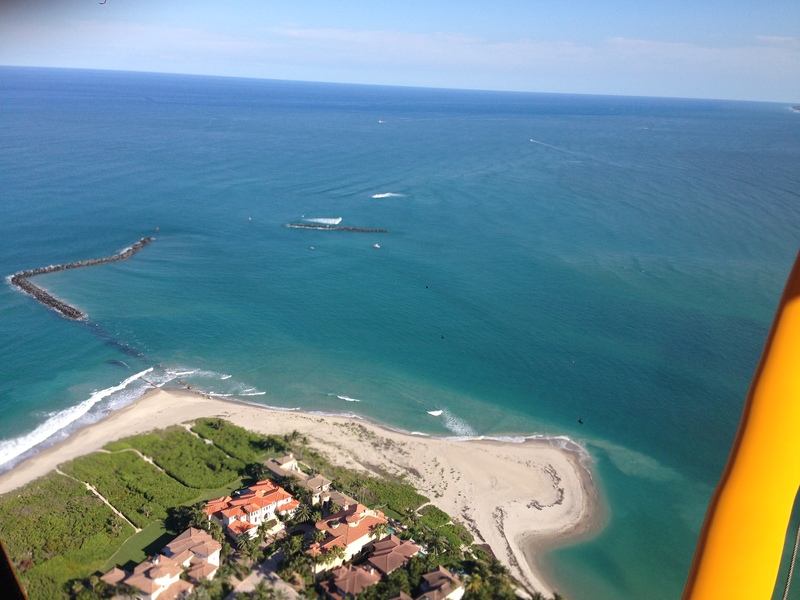 Sailfish Point in foreground and Atlantic coast on Hutchinson Island. 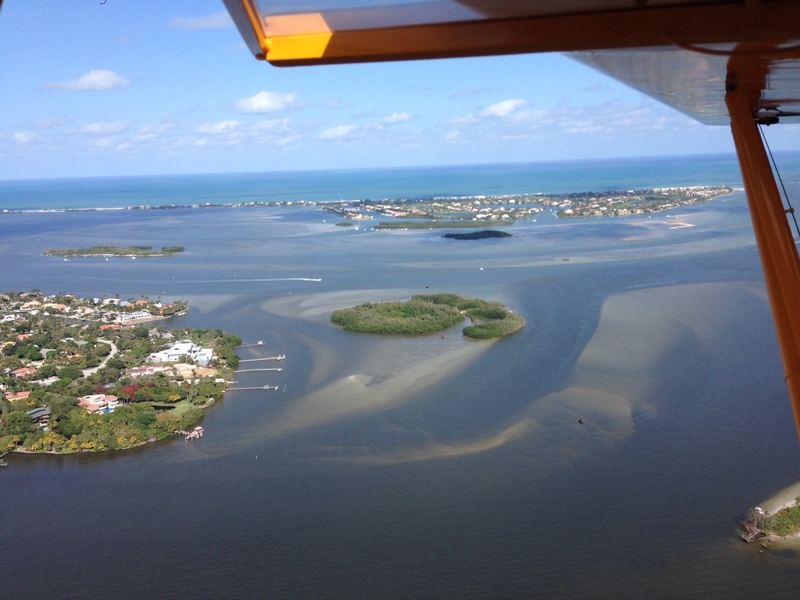 4-13-15 Sailfish flats seagrass beds looking south-west, Sewall’s Point peninsula in eastern area of photograph. photo Ed Lippisch. 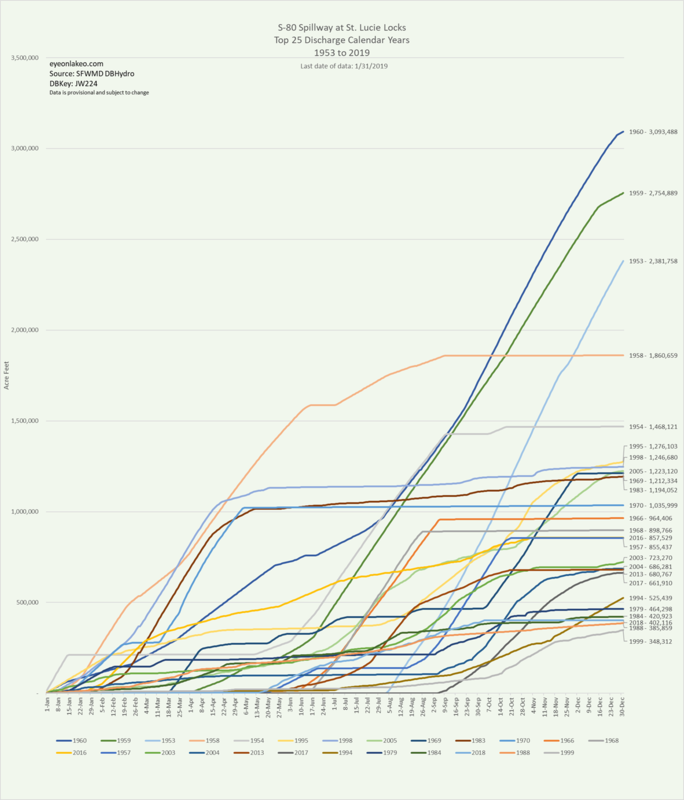 Good news that the releases have stopped for now. Nice to see some blue green water. Thank you! 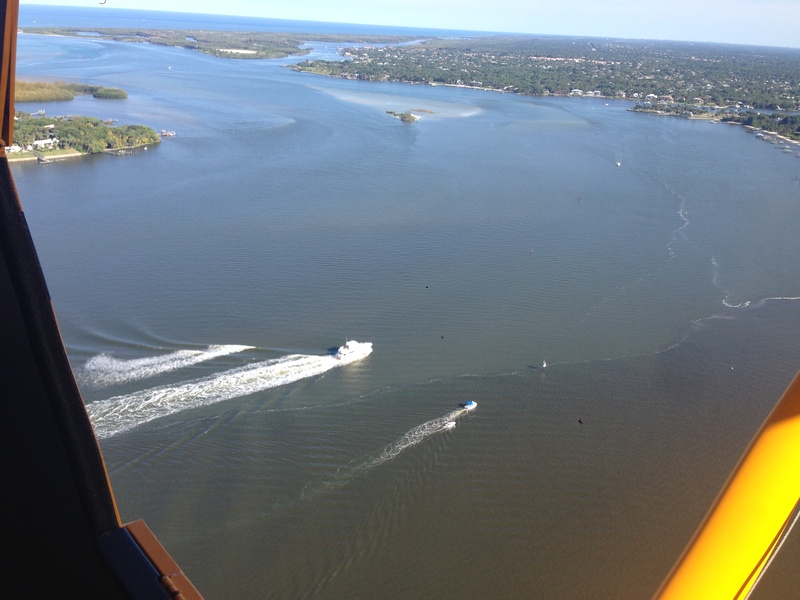 For comparison, here is a photo from 3-18-15 at the southern tip of Sewall’s Point looking towards the St Lucie Inlet, while the ACOE was releasing. 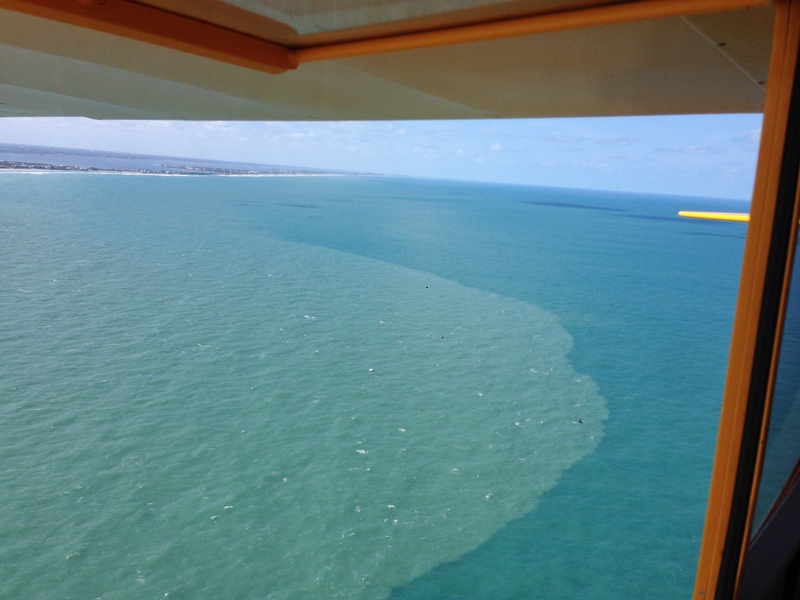 This blog is part of series: “Documenting the Destructive Discharges 2015;” on front page of blog you can search for other entries. With all the fanfare of President Obama’s visit and the confrontation that seems likely at the April 2nd SFWMD, Water Resources Advisory Board meeting between “Stop the Land Grab” (http://goo.gl/2YVLXT) and the River Warriors, it is important to keep our “eye on the ball.” THE RIVER. 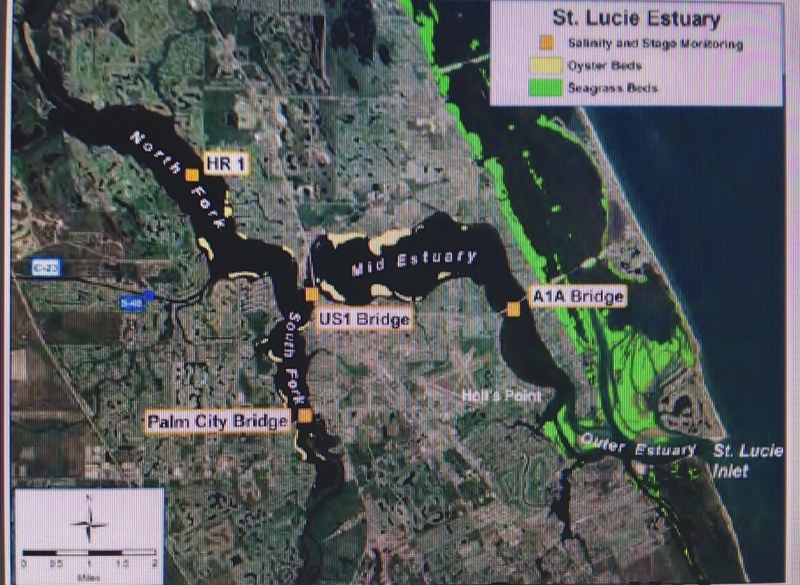 As mentioned in an earlier blog, the ACOE is PULSE RELEASING and lowering releases into the SLR through S-80 right now in an attempt to help Martin County evaluate bacteria testing that cannot be done during heavy discharges. 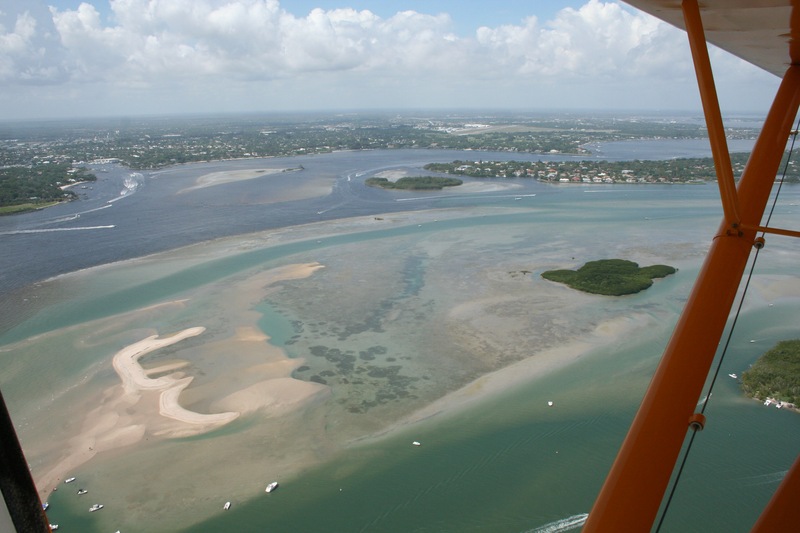 It is interesting to note that pulse releases mimic nature so that the estuary is not continually pounded, and can recover a bit. Just like during a rain event, the water flow is intense, salinity drops, and then salinity increases when the water lets up. You can see the schedule below. ACOE pulse release schedule May 26, 2015. 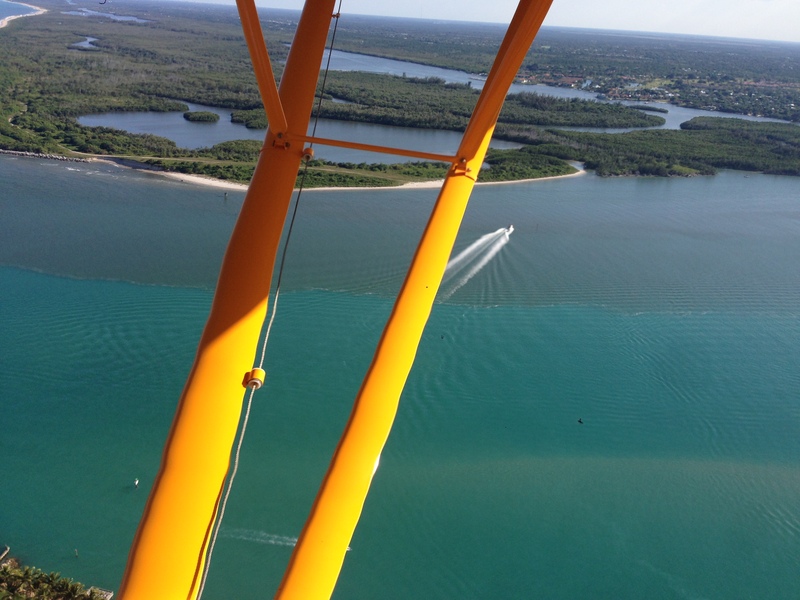 S-80 is the structure from the C-44 to the SLR letting in water from S-308 at Lake O. 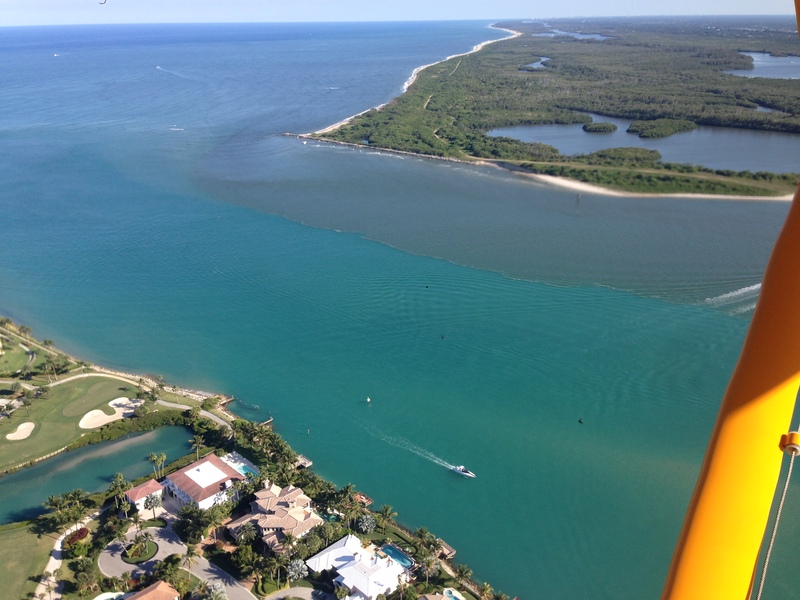 One of the most interesting photos is of Sailfish Point’s marina where the runoff into the SLR/IRL is very apparent. There is always runoff from land into the rivers, yet we must remember the rain takes everything on the land with it: fertilizer, pesticides, herbicides, loose sediment….Martin County’s strong fertilizer ordinance rules don’t begin until June 1st, so it is likely that this runoff is full of pollution that like releases from Lake Okeechobee or area canals is not good for seagrasses. 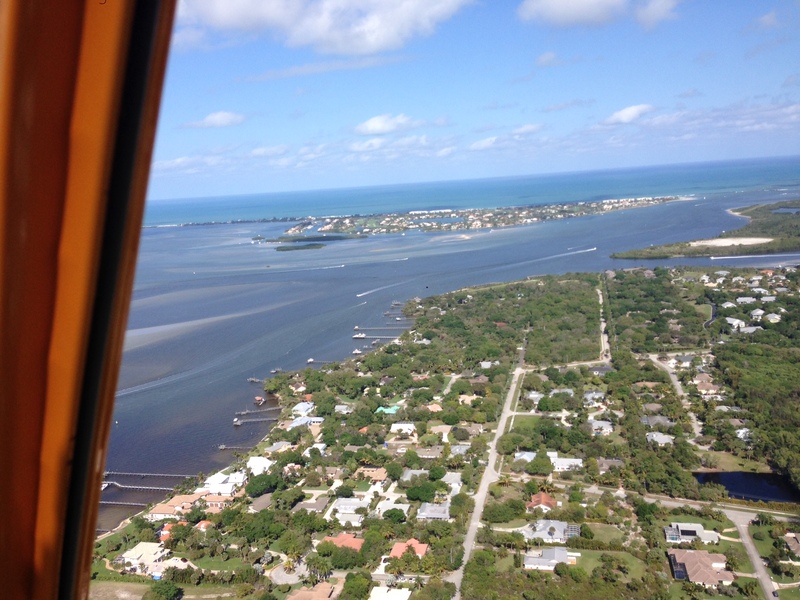 For me the aerials of the seagrasses are most depressing. The once healthy beds look horrible. One can see they have algae all over them . 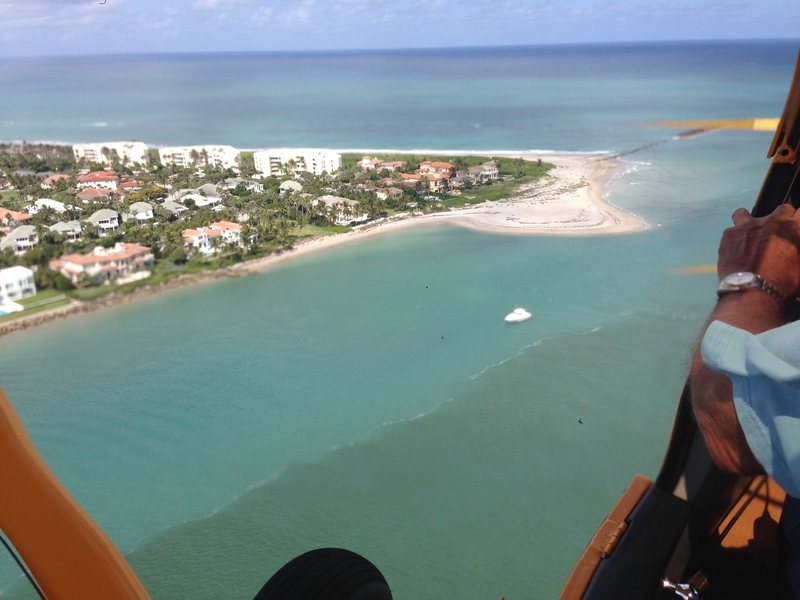 Maybe I’m hyperbolizing, but the seagrasses do not look good to me. Having grown up here and swam in these area waters as a kid when they were lush and full of life—-the present condition is not acceptable. Anyway, let’s keep our eye on river and we move through all these politics, and here is a look from above at YOUR RIVER! 1. 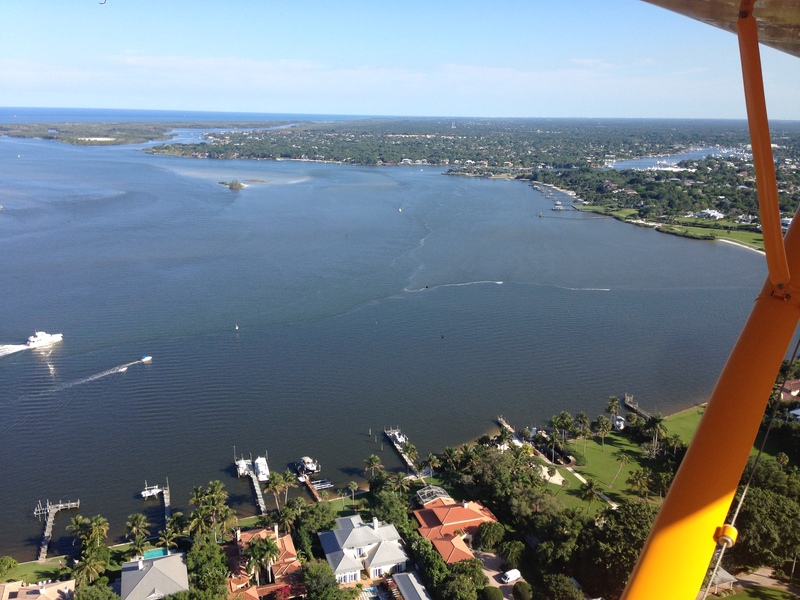 SLR/IRL Crossroads with Willoughby Creek area in foreground looking towards Jupiter Narrows and the SL Inlet. 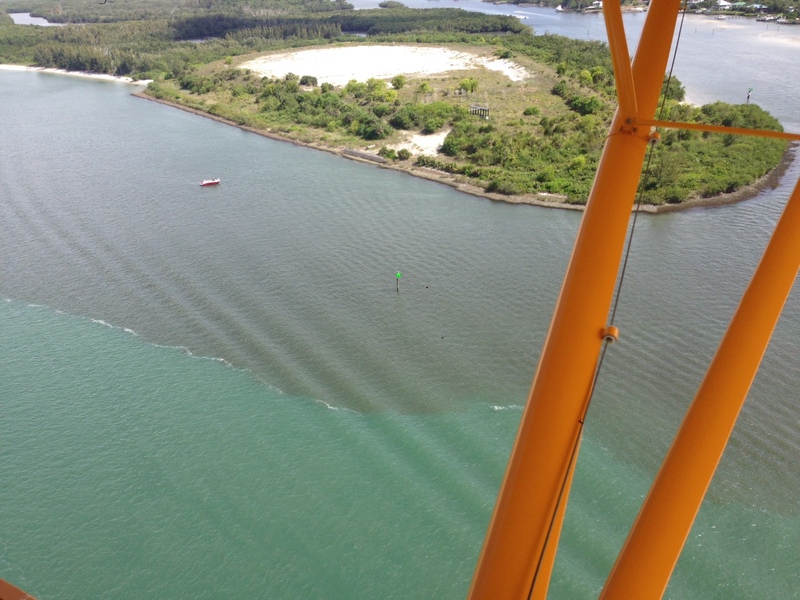 2 Confluence of SLR/IRL off west side of Sewall’s Point. 4. 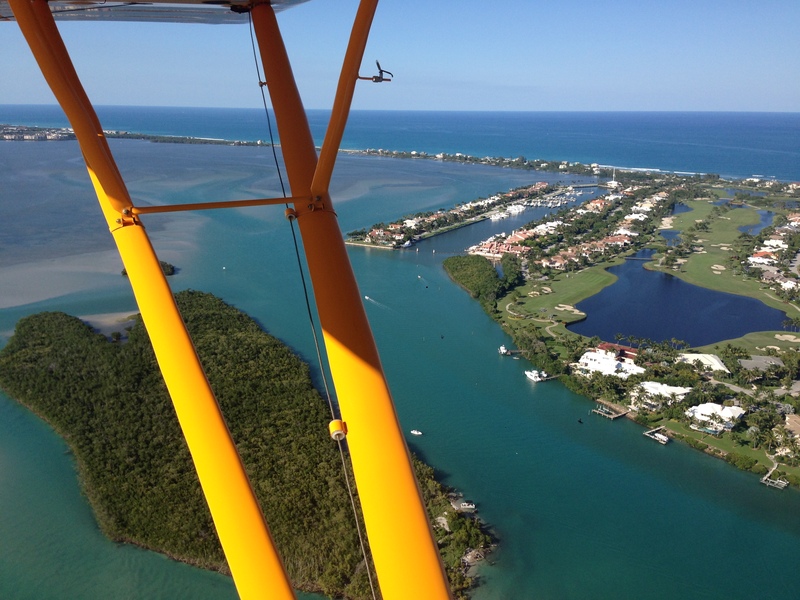 Sewall’s Point looking towards Hutchinson Island, IRL. 5. 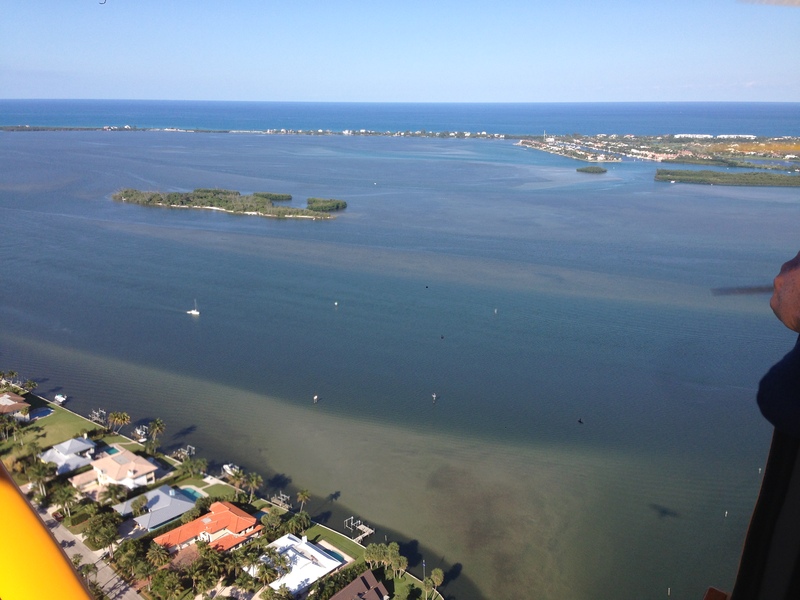 Unhealthy looking seagrass beds off of Sewall’s Point and Sailfish Point. 6. 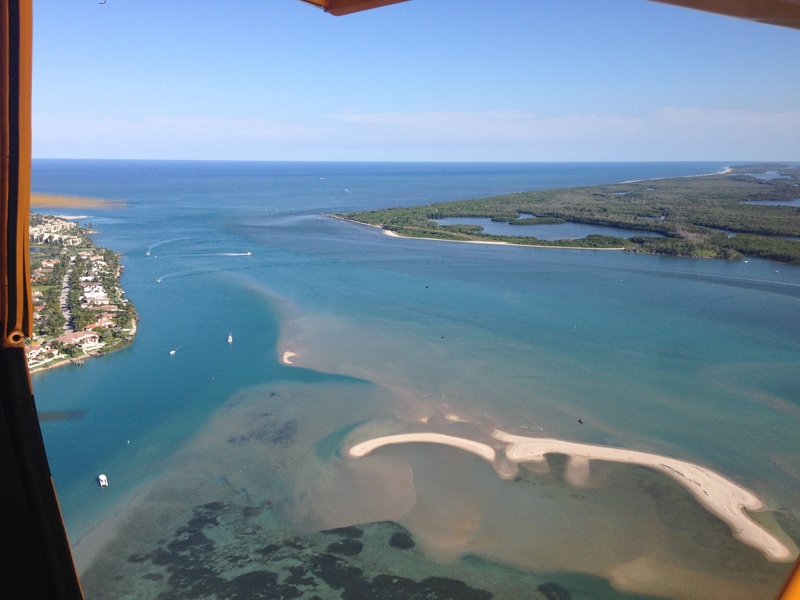 Sad looking seagrass beds seem to have algae on them thus so dark and flat looking…. 8. Sailfish Point and Simpson Island. 10. 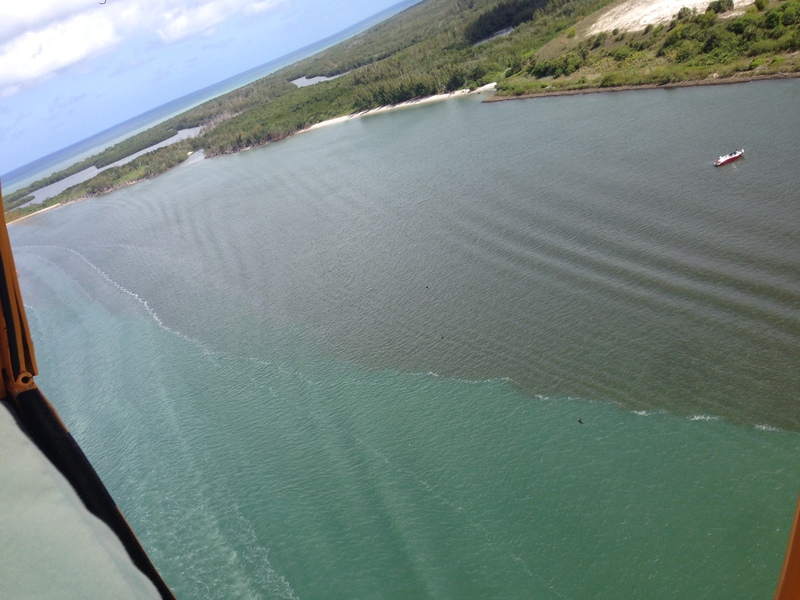 Martina at Sailfish Point with runoff from land due to rains. 11. 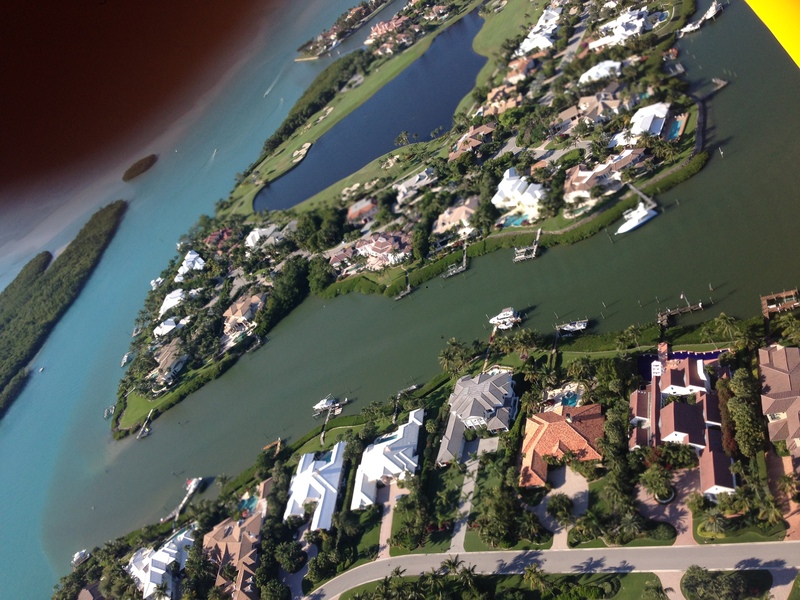 Another shot of Sailfish Point Marina. 12. 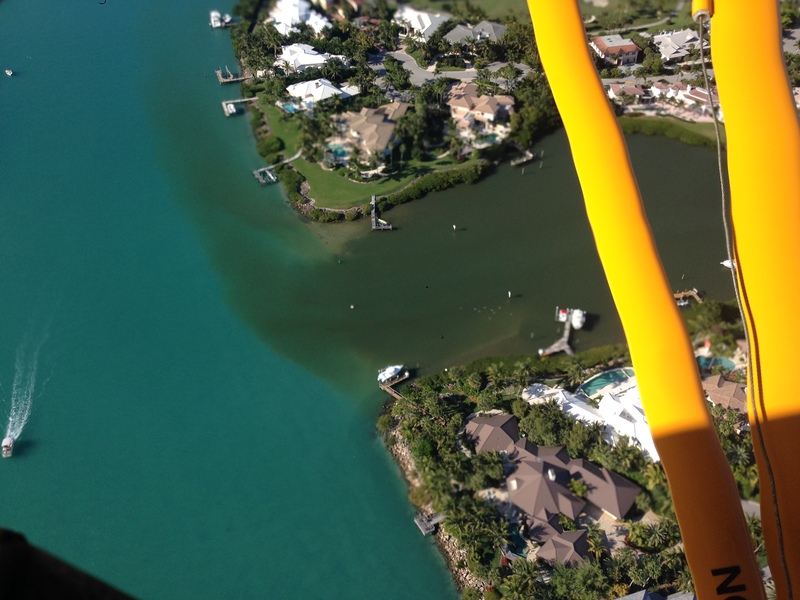 Long shot of Sailfish Point marina with runoff clearly seen and Ed’s thumb! 13. 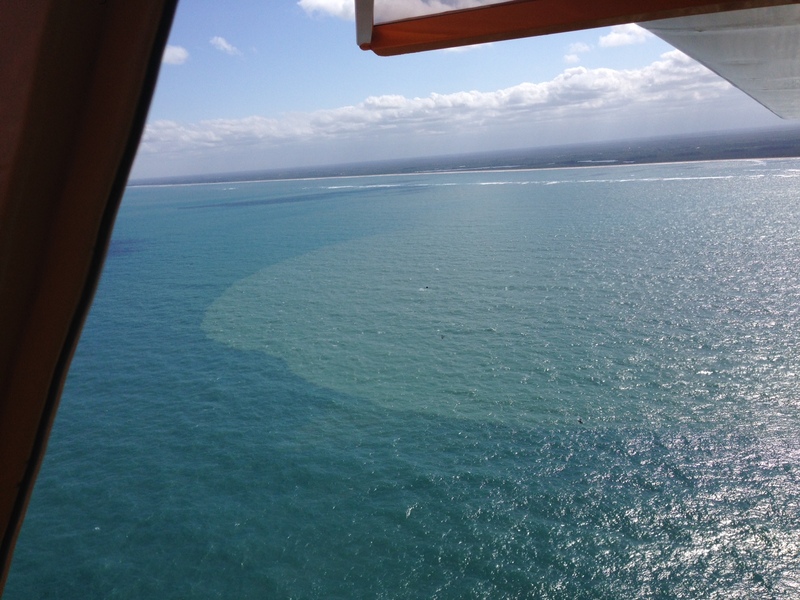 SL Inlet with plume on left as incoming tide enters. 14. Hole in the Wall with plume and incoming tide. 16. 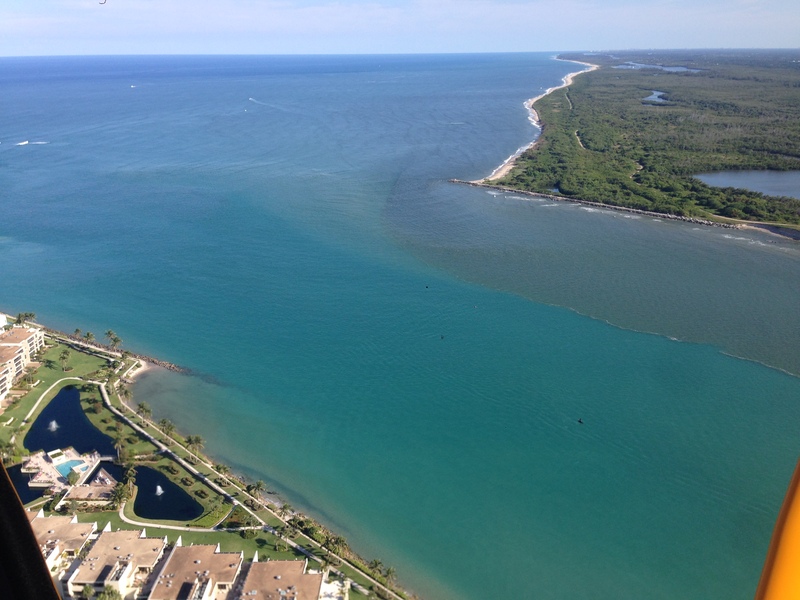 Sailfish Point and inlet; north side is clean incoming tide-water. 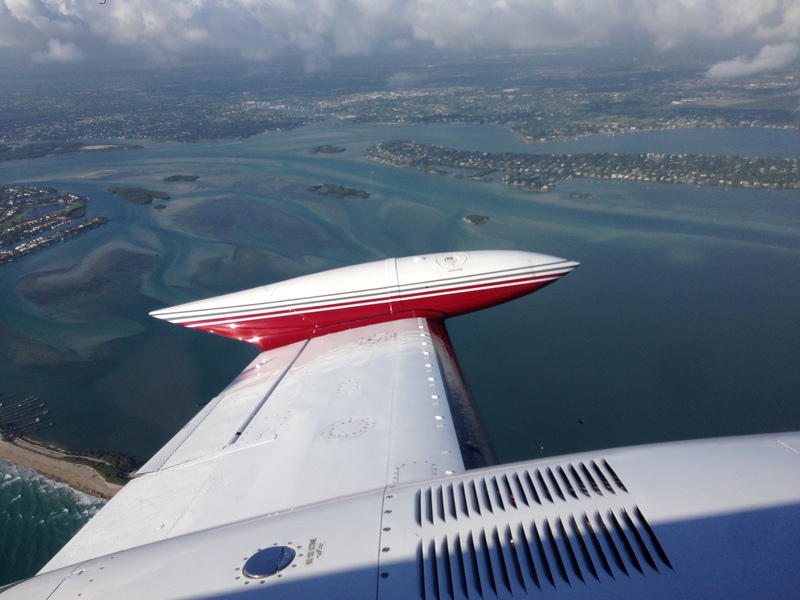 Plume goes south…. 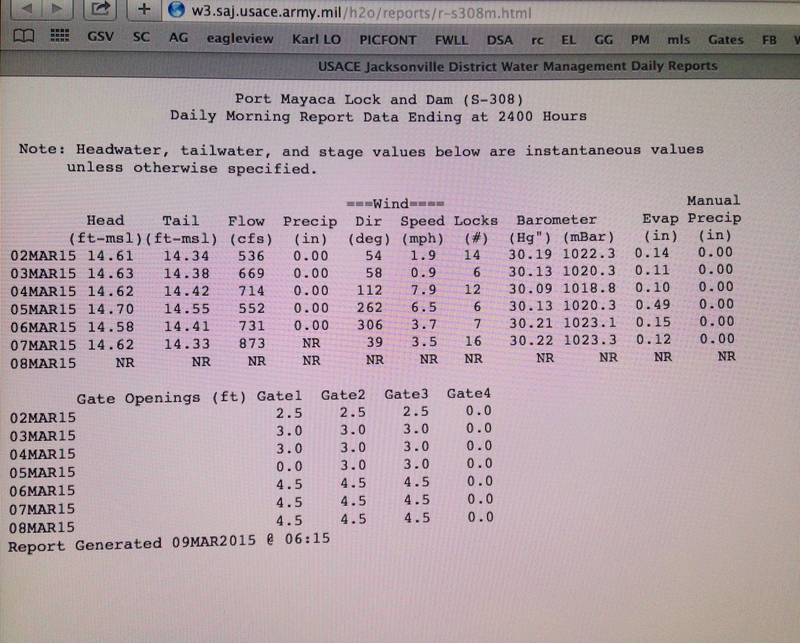 ACOE/SFWMD discharge most recent discharge chart. 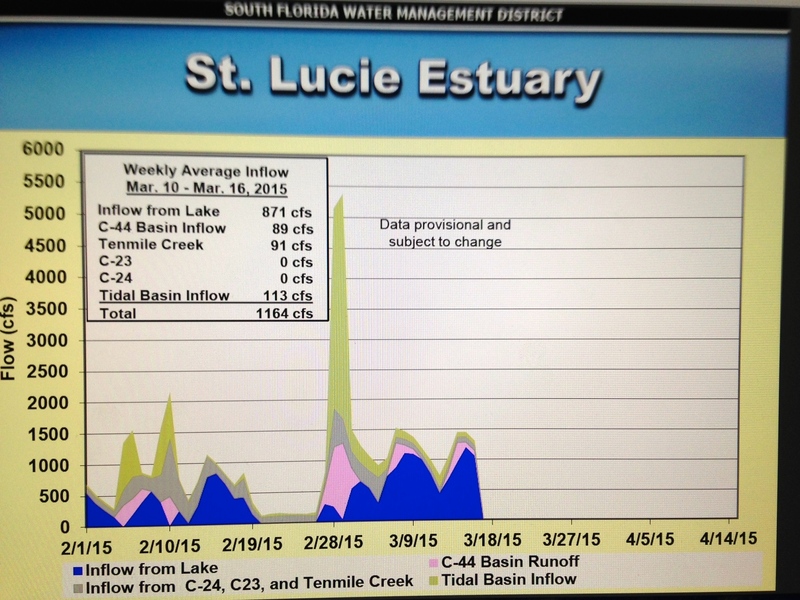 Most is from Lake O in this chart as seen in blue. 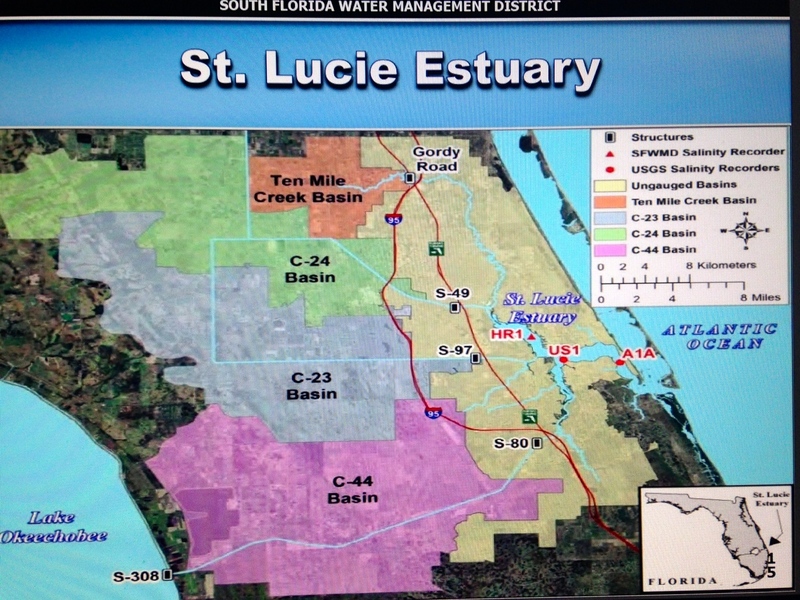 ACOE S-308 structure showing water released into SLR/IRL from Lake O.
ACOE excerpt —Info that goes with the above pulse release schedule; it is from 3-26-14. Another will call will occur today and updates will be considered. 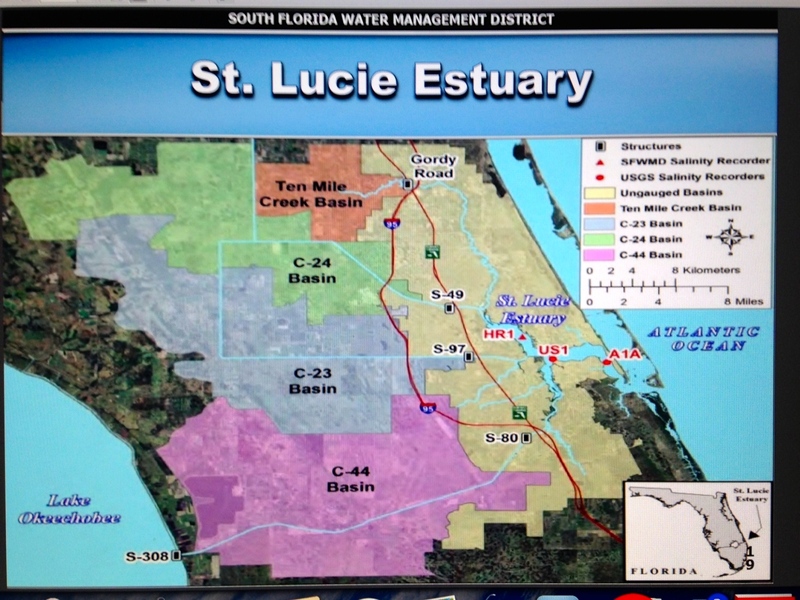 “Based on the current lake levels, tributary hydrologic conditions, and multi-seasonal forecast, 2008 Lake Okeechobee Regulation Schedule (2008 LORS) Part D guidance is up to 3000 cfs at Franklin Lock and Dam (S-79) and up to 1170 cfs at St. Lucie Lock and Dam (S-80). 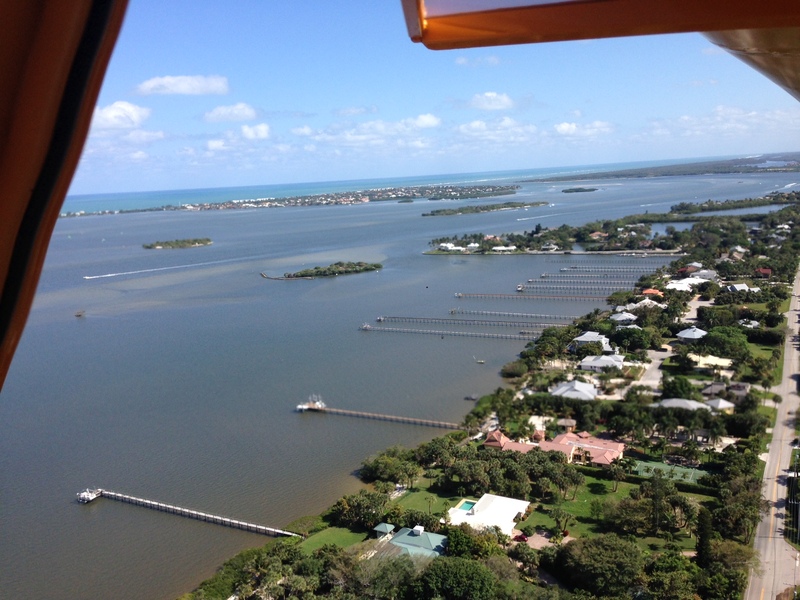 We have considered stakeholders input and recommendation from the South Florida Water Management District. 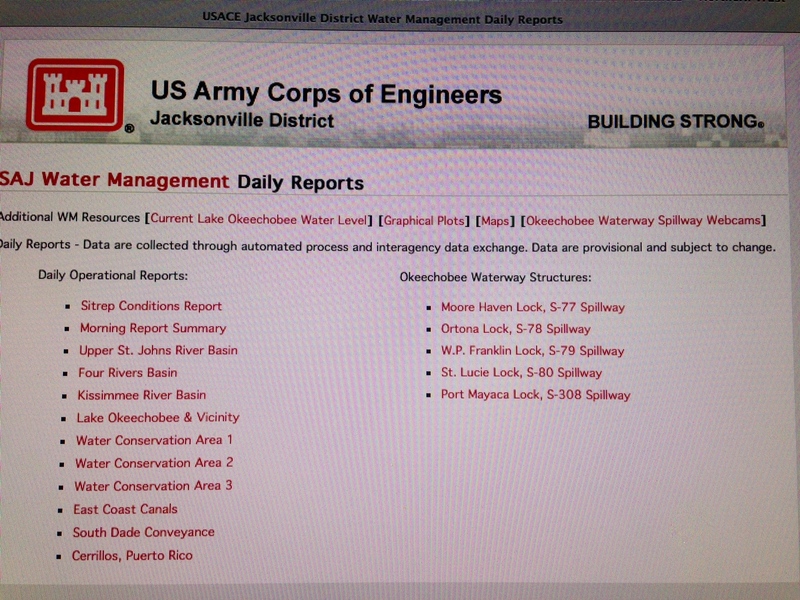 The U.S. Army Corps of Engineers Jacksonville District will be continuing discharges at S-79 at the same level as last week. However, the target discharges are reduced at S-80. 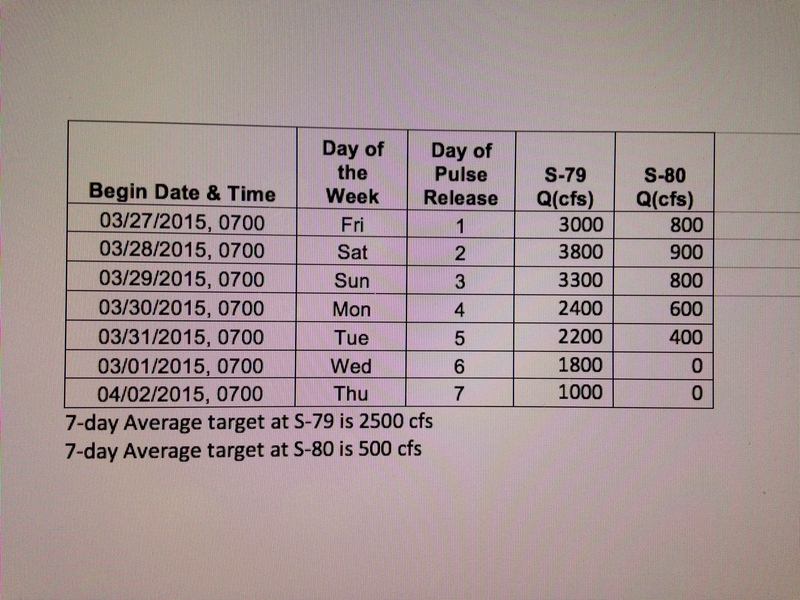 The target flows over a 7-day period will be an average of 2500 cfs at S-79 and 500 cfs at S-80 cfs. These discharges will be made in a pulse-like manner (see attached). 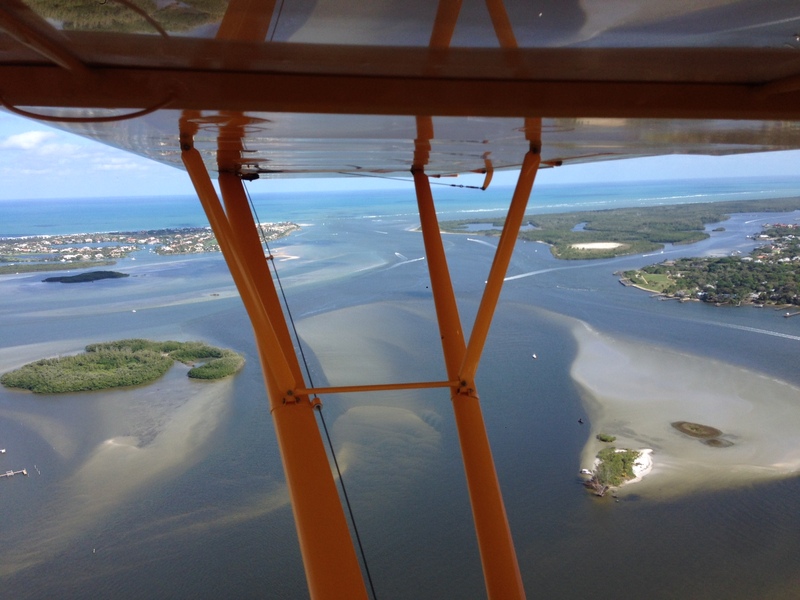 Yesterday, around noon, hours into an outgoing tide, once again, my husband Ed and I flew over the rivers to document the polluted discharges from Lake Okeechobee and the area canals pouring into the St Lucie River/Indian River Lagoon. 1. The photos from 3-15-15 throughout this blog. Please contact me if you have questions. Thanks for your help. 3. 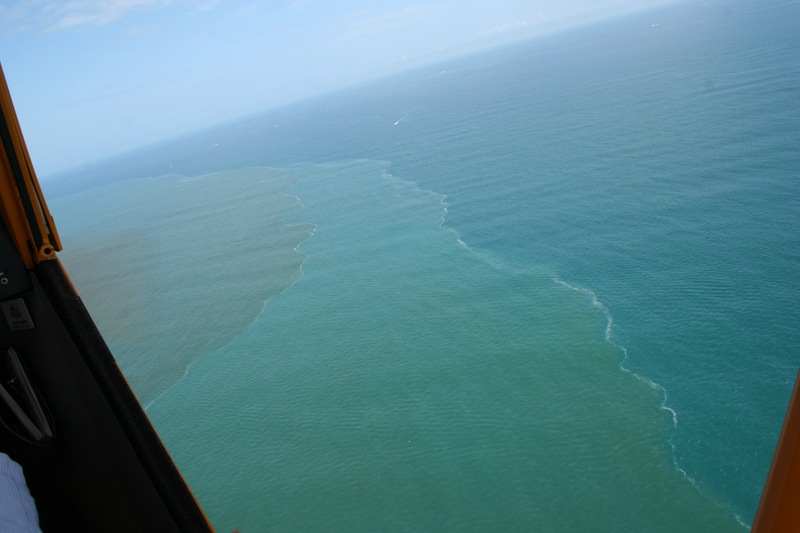 Florida Oceanographic’s water quality chart, 3-12-15. 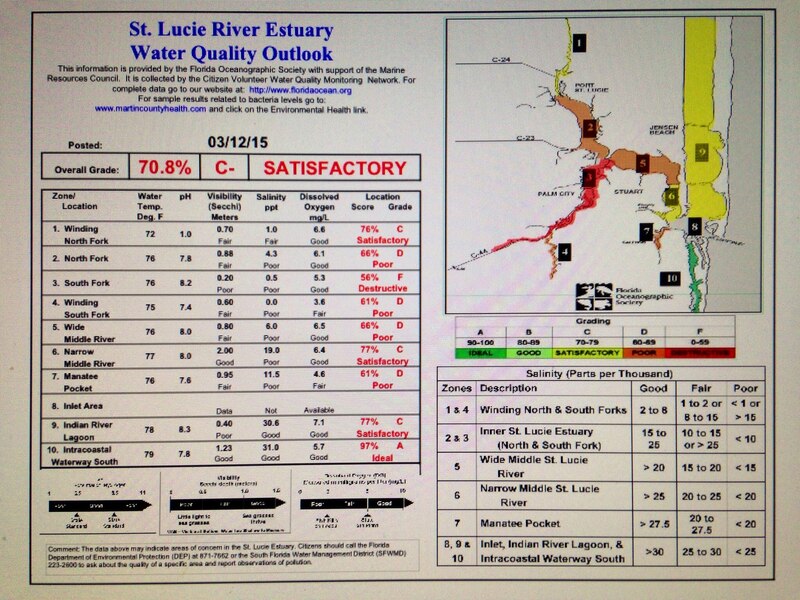 Today the Lake Okeechobee is reading 14.56 feet. 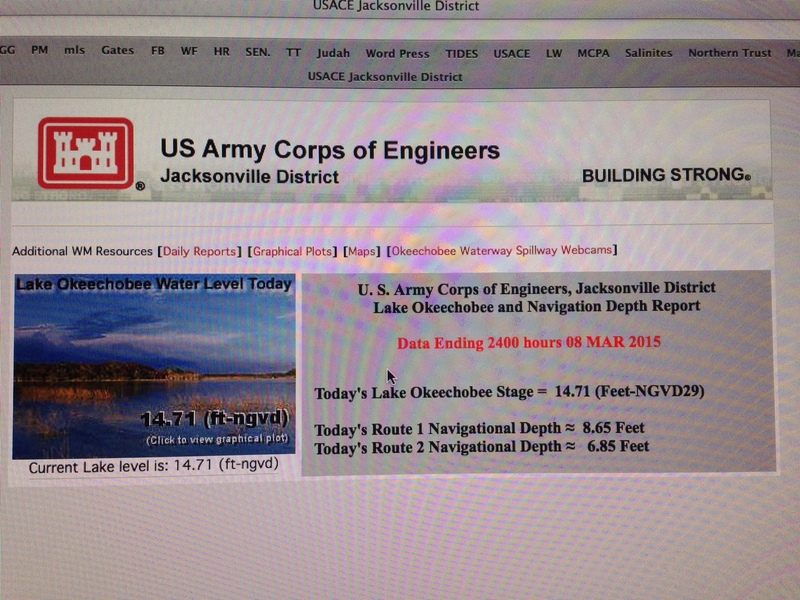 It is going down thankfully and the goal would be 13 feet if the ACOE and SFWMD were allowed to say it…. 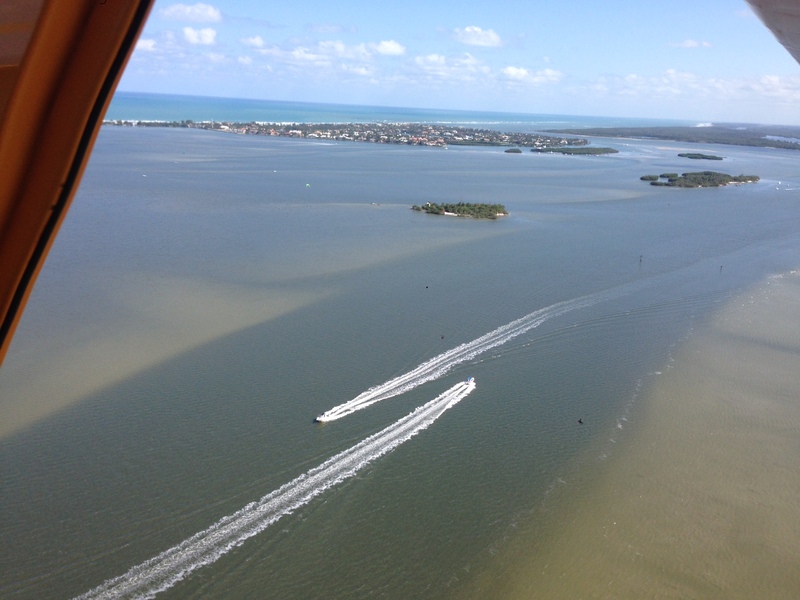 These releases could not come at a worse time, as we are already inundated by area canals and it is the beginning of spawning season, oyster spating season, and the warm weather drawing the public to area waters, like the Sandbar in the photos below. This year, the ACOE has been dumping since January 16th, very early in the year, foreshadowing another possible toxic summer. In response to these releases, last Thursday, many of the “River Movement” including the River Warriors, continued their fight for clean water at the SFWMD as hundreds pleaded for US Sugar option lands to be purchase south of Lake Okeechobee in order to, over time, create a reservoir to store, clean and convey water “south” to the water starved Everglades. 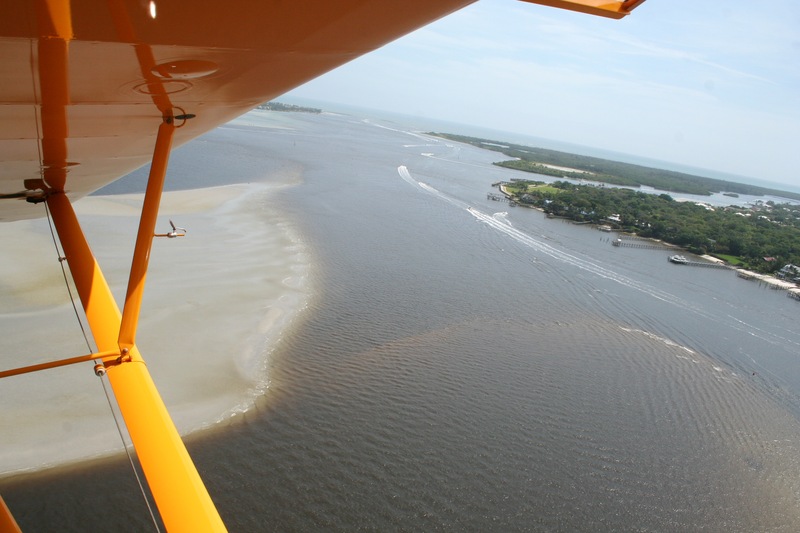 The people realize the amounts of water coming into Lake Okeechobee from the Kissimmee River are so tremendous there is no other way to offset the destruction of the estuaries except with a third outlet south of the lake. Activists have been pushing for the this for decades but since the toxic summer of 2013, known as the “Lost Summer” a tipping point has been reached.